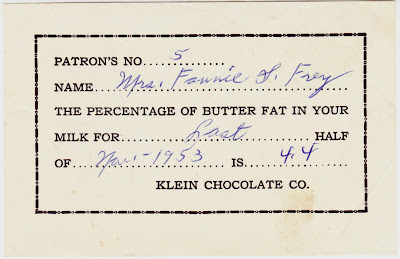 This little slip of paper, which has survived for 59 years, indicates that Mrs. Fannie S. Frey's milk had a butterfat percentage of 4.4 at one point in 1953. That milk would have been slightly richer and heavier than whole milk, which traditionally has a butterfat percentage of 3.25, according to this chart. According to the Elizabethtown (Pa.) Historical Society, Klein Chocolate Company "was incorporated in 1914, a year after William and Frederick Klein1 began manufacturing milk chocolate in Elizabethtown. Klein Chocolate Company became a major player in the candy business with national distribution for their products. By 1922 the company employed 200 people and produced 250,000 chocolate bars a day. To produce that chocolate the plant required six million quarts of milk a year, which gave area dairy farmers a steady market." 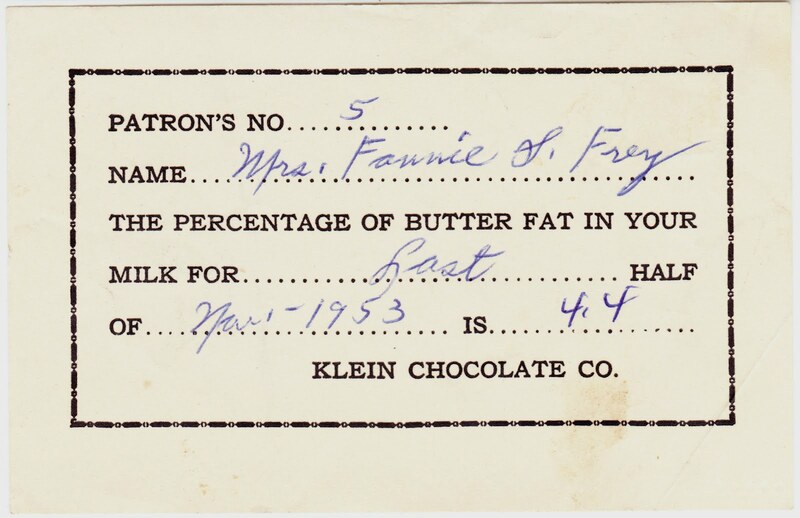 It's likely that Fannie S. Frey was one of those dairy farmers providing milk for Klein Chocolate. A woman by that name lived 90 years -- from 1886 to 1977 -- and is buried in Elizabethtown. "Dorothy was born March 20, 1911 near Elizabethtown, Pa., the oldest of thirteen children. She was the daughter of the late Elias T. and Fannie ­(Daveler) Frey. About 1916, Dorothy and her family moved to their family farm on Rutts Road, Elizabethtown. "Dorothy attended one-room Rutts School, walking a mile each way. She helped take care of her younger brothers and sisters and worked on the farm." Elizabethtown, March 11 (AP) -- A fire which was believed to have started from an overheated fodder shredding machine destroyed a complex of farm buildings and killed some livestock near here today. Five men were slightly burned and another suffered smoke inhalation while rescuing some livestock at he farm of Mrs. Fannie Frey, of Elizabethtown R.D. 1. Her son, Claude, said he had been operating a shredding machine and apparently a bearing overheated, setting fire to the fodder. It spread to a barn, chicken hut and other structures. Damage was estimated at $25,000. Several farm machines were damaged. Five pigs and 280 chickens were lost in the fire. Meanwhile, Klein Chocolate Co. was sold to Mars -- maker of M&M's, Milky Way and Snickers -- around 1970. "[Milton S. Hershey] was even able to get along with the Klein Chocolate Company, which was founded by a defector from the Hershey ranks. William Klein and his siblings made competing items at a factory in nearby Elizabethtown, which was served by the Hershey trolley. But Klein, who once served Hershey as an industrial spy, always got along well with his old boss. He even sold Hershey his excess cocoa butter." I was posting some old books for sale on eBay and noticed something sticking our of one of the books. It was a candy wrapper, I guess used for a book mark, from Klien's Lunch Bar, Milk Chocolate and Peanuts, price 3 cent, manufactured by Klein Chocolate Company, Elizabethtown, Pa.
Just about every day on my way home from elementary school, I would stop by the candy store on Edgemont Street, owned by Dominic and Dolores. 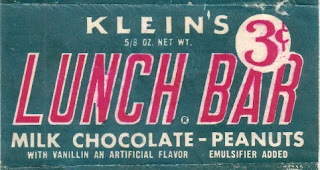 Scanning the candy display cases, looking at all those wonderful confections, Ialways go back to the Klien's 'Lunch Bar' or a few squares of 'GRADE A' chocolate ....such fond memories of simple pleasures. i live in Elizabethtown and my dad lived when kliens was open.i love this history it is soooo cool when it is history I now.i wish I lived back then to see what elizabethown looked like. I also wish they had not sold to m+m and mars.